For Anna Colquhoun, Riverford’s Preserving Guru, January and February mean one thing in her kitchen. Citrus. Kilos arrive from Riverford, all lugged in crates by local driver Richard who always smiles and never grumbles. 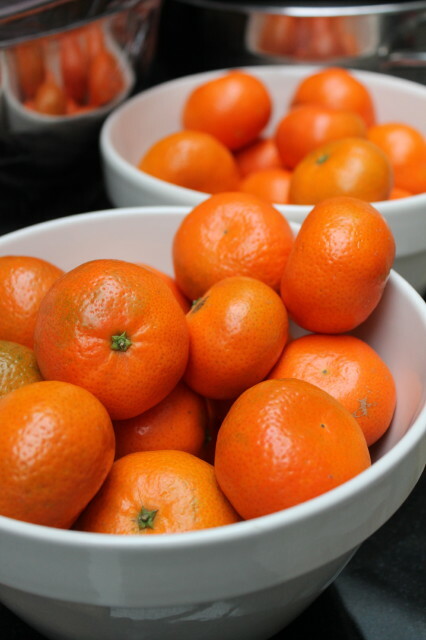 The Seville oranges, blood oranges, lemons and clementines are fantastic – bright, ripe, full of juice and flavour and of course unwaxed. 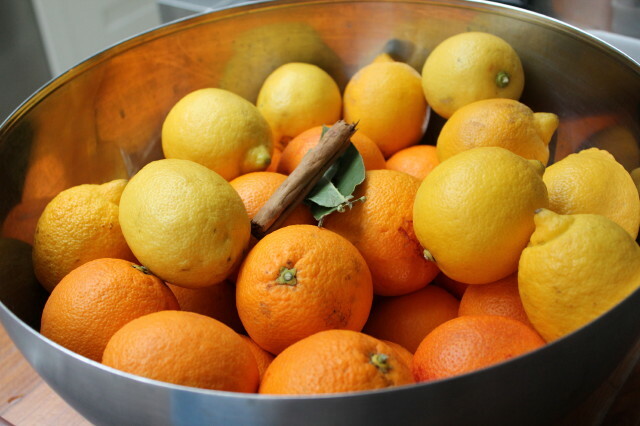 They are some of my favourite things to preserve, as their colours stay true in the jar – a citrus rainbow of red, orange and yellow – and the boiling vats perfume the whole house. 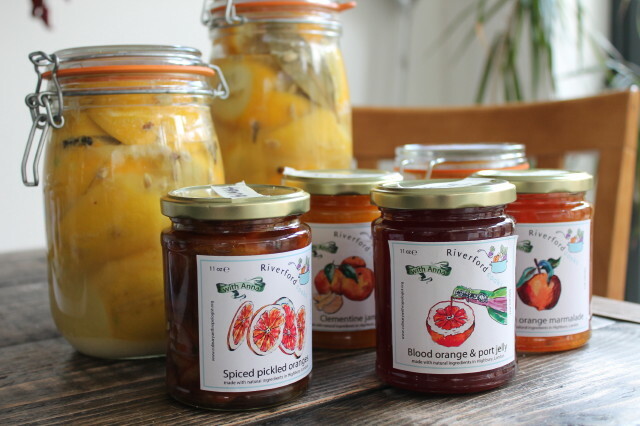 In my classes coming up in Feb we will make marmalade, spiced pickled oranges, blood orange and port jelly, clementine jam and Moroccan preserved lemons. These are easy to make and something special to add to your pantry of ingredients. They are distinctive of Moroccan cuisine and go brilliantly with roast or braised chicken and fish, in chickpea and couscous dishes, and in salad dressings and salsas. Chicken, olive and preserved lemon tagine is a classic, but why not also try spiced squash with preserved lemon or shoulder of lamb with preserved lemon. You can find my recipe here. Preserved lemons are ‘lactofermented’, like some of the world’s other best foods – sourdough bread, yoghurt, chocolate and kimchi, to name a few. Friendly bacteria enjoy the salty conditions, multiply, squeeze out any unwanted micro-organisms and produce lactic acid and carbon dioxide. 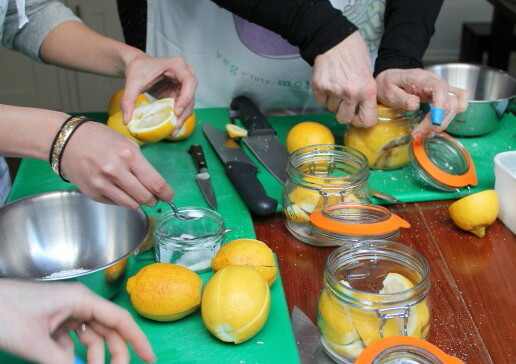 The former gives the lemons their distinctive texture, flavour and aroma, and the latter displaces the air in the jar. The clever clip-top preserving jars let excess gas escape, so they don’t explode. The bacteria like pure fine salt, that is to say not contaminated with those mysterious ‘anti-caking agents’. Find it in wholefood and heathfood shops, or buy one of those expensive flaky sea salts and grind it in a mortar or processor. Fermentation takes around a month at warm room temperature. Make sure the lemons stay submerged in the salty juice. You might notice the jar fizz or sputter – good signs it’s working. After fermentation keep the jar somewhere cool and dark and try to wait another month or more as they improve with age. In Morocco I met a women who proudly showed me her syrupy seven-year old specimens. (Not that I’m recommending that here.) Fish out a lemon with a clean utensil, give it a rinse, cut away the flesh as it will be too salty and dice the translucent rind. Pick up a Riverford Kit, some jars and granulated sugar and you’re away. Bitter oranges are inedible raw, but deliciously bittersweet when transformed into marmalade. They originated in China and later became popular in the Arabian empire, through which they spread around the Middle East and Mediterranean, as far as Spain, which remains a main production area. 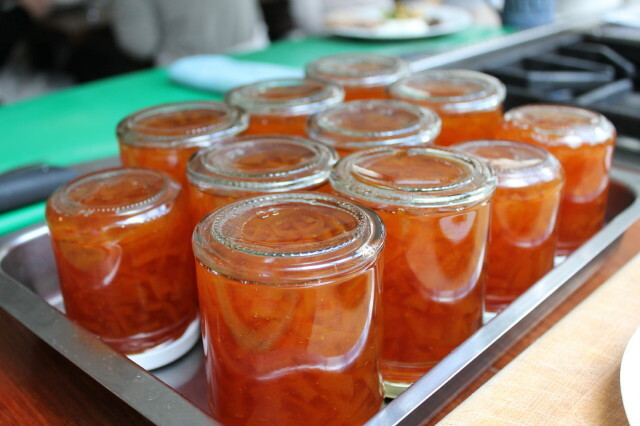 There are different methods for making marmalade, but all have several things in common. First, the rind is boiled before it’s cooked with sugar, since the quantity of sugar involved will stop it softening. So make sure the rind is tender enough to easily penetrate with the tines of a fork before proceeding. Second, the all-important pectin is in mostly found in the pith and pips, so these are retained and used to impart their setting power, although strained out so as not to cloud the jelly. Third, all the sugar must be gently dissolved before you boil, since stray grains on the side of the pan can cause a whole jar to crystalise. Nothing wrong with crunchy jam, but perhaps not what you were after. For a darker, richer ‘Oxford style’ marmalade, stir in a couple of tablespoons of black treacle. 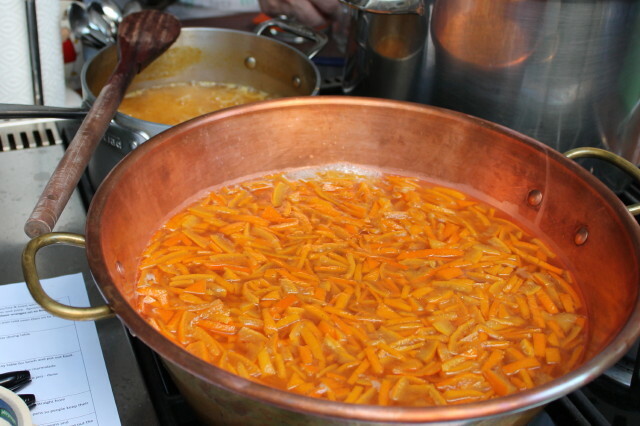 You need a big pan so the marmalade has space to boil furiously to reach setting point, which happens at around 104C. Jam thermometers are not perfectly accurate, so better to use the cold saucer test – see my preserving guidelines for details. Watch as the steam dies down and the bubbles seem slower and less watery – signs you should be testing. It could take as little as 15 minutes or as much as 50. When ready give it a few minutes so the rind disperses before pouring into jars, or they will be top-heavy with rind. If there is scum, gently fold it in, skim it off with a spoon or dissolve it by stirring in a knob of butter. For those so inclined, now is the time to add a dash of whisky. 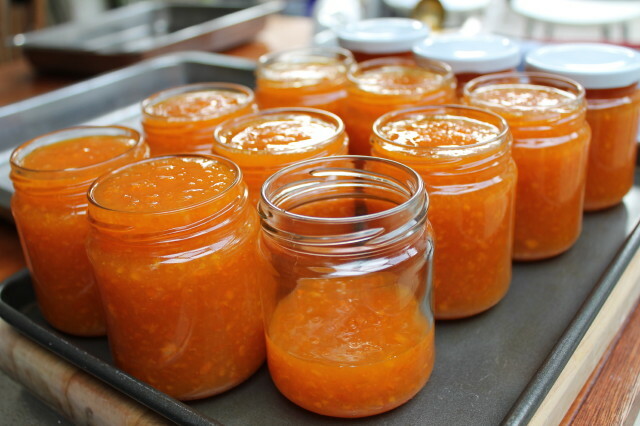 Of course, there’s no need to limit your marmalade to your breakfast toast. It’s great in bread and butter pudding, on steamed puddings and cakes, as a glaze for meats (ham, chicken, duck), in ice cream, and even in cocktails (marmalade whisky sour, anyone?). Look out for our next preserving kit for clementine jam, which is probably my new favourite citrus preserve as it’s so ridiculously easy to make and retains so much of the raw clementines’ bright colour and flavour. I promise you’ll love it. Whether you’re an experienced or novice preserver, please let me know how it goes, ask me any questions and share your own tips by commenting on this blog below, writing on our Facebook page or sending a tweet to @Riverford with the hashtag #cooksquestion. 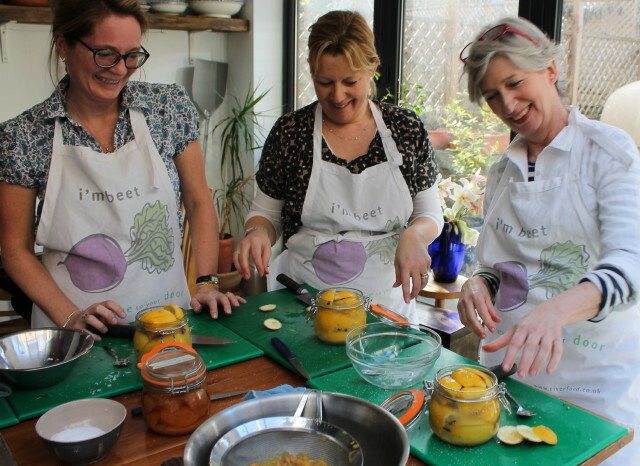 This entry was posted in Uncategorised and tagged Anna Colquhoun, citrus, cooking, fruit, marmalade, preserved lemons, preserving, recipes. Bookmark the permalink. I chop the oranges into quarters and boil them up with enough water to cover, and simmer for at least an hour. I then remove the orange, retaining the liquid. Remove the pips and slice up the oranges, pith and all. Return to the liquid and measure quantity in a jug. Put all back in the pan and when at boiling point, add sugar, one pound to one pint. Boil to set point and put into warmed jars. I have tried cutting away the outer skin, leaving the pith, but found the resulting marmalade to be lacking in the bitterness associated with Seville oranges. Thanks for sharing your recipe! I like it. It’s essentially the same method as both Riverford’s recipe and my own, in that the rind is cooked to be soft, and then the sugar is added at a pound to a pint ratio. Personally I prefer to scoop out the flesh of the oranges after they’ve cooked, just for a clearer jelly around the pieces of chopped rind. I leave in all of the rind (not just the zest) so it’s nice and bitter, and also make sure I get all the juice from the flesh and pip mixture. The juice itself is very bitter; these oranges are not nice raw! Hope you are making lots of batches with Riverford’s Sevilles before the season ends!